Advice Needed: Is This A Good Deal? I have been in couponing distress over Albertsons for the past six days. Last Wednesday, the diaper deal looked so promising that my friend Melinda & I purchased 40 Pampers coupons off ebay. By the time they arrived in the mail, it was clear that the deal was falling apart and was not nearly as good as was initially reported. Because I bought the coupons, I felt obligated to do the deal. I paid $3 for these stinking pieces of paper and I needed to put them to use! I felt the same pull I felt when I first started couponing last winter–it’s like the coupons were burning a whole in my pocket and I HAD TO USE THEM! This constant urge was keeping me from thinking rationally about the deal and if it was really worth it. I decided Sunday that I was not going to attempt to roll the diaper deal. I didn’t want to spend the next three days in and out of Albertsons and honestly, I was afraid of the possible rejection. I HATE it when a deal doesn’t work out and I feel like an idiot. And I still feel like a fool, even after a year of doing this and scoring great deals consistently. 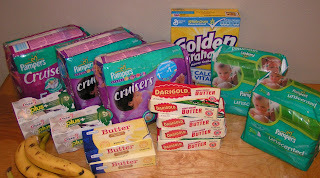 3 jumbo packs of diapers ($24 after coupons & doubles), 2 packs of wipes ($10), 4 Darigold butters ($5.60 after coupons & doubles), 2 Albertsons butters ($2.98), Golden Grahams ($2–yummy), 2 Yo-Plus yogurts (free after coupons & doubles), and a couple of bananas for filler ($1.65). I paid $31.23 out of pocket (and used $15 in catalinas) and still have one $5 cat for a future purchase. OK, I know it’s not a great deal. But what do you think? Did I get a good deal? I think when I figured everything out, I paid $42 OOP for 9 packages of diapers and 3 packages of wipes. And I have $20 in cats left. That comes out to about $2 per package of diapers and less for the wipes. If I kept rolling the deal i would still be paying $8 OOP everytime and I didn’t have that in our budget. So I feel good about it but I spent plenty of time agonizing over it as well. 1) Be happy anytime your coupon clipping brings your OOP lower than you would've paid at WinCo or Wal-Mart. 2) Obsess about every coupon & scenario until you feel like you're going certifiably insane. I admit, I lean toward #2 more often than I'd like. I'm pretty sure couponing has taken several years off my life, thanks mainly to Albertson's. So I say, good deal. When would you walk out of the W's with so much for so little? I tihnk that was quite good. I made myself INSANE and went back to Jewel (my Albertsons) about 15 times. I did the cereal deal about 10 times (maybe more?) – buy 7, use 7 coupons, it ended up being $10 ish OOP each time, paid with $10 in cats, made $15. I also did it with Chex mix (necessitating me going to 3 friends to print coupons) but made $5 overage as well. But I was insane. Seriously nuts. But today I got my $70 shopping down to $4.49 OOP! most definitely a great deal for all that!! I know what you mean too, plus it’s a lot of work to put scenario’s together with coupons. W2G! I read on HCW that the $30/$15 is still working. I wonder when it will end?? I sent a msg to Albies last Friday and they said this deal would be ending on 1/13, but it looks like it’s still working. I’m glad to know an experienced couponer still gets emotional in this. I’ve been doing this for only a few weeks and was so upset a few nights ago after a Kmart experience and just couldn’t shake it for a while. I hated spending so much when I was hoping to leave having spent a few dollars. I felt like yelling at the cashier “THE BLOGS TOLD ME THIS DEAL WOULD WORK!” but I figured that wouldn’t go over well. I agree with the others – you did get a good deal. Not necessarily great by your normal standards, but when you’re buying something you absolutely need, getting it cheaper than retail is good. If it was something you didn’t absolutely need, it would be not so good. BTW, I found a “free Starbucks tea” coupon in the new Safeway ad last night! I guess I can get a free one each day until next Wednesday! I think this looks like a great deal…you easily have $14 worth of butter there alone and I’m sure the rest of the groceries would total another $12-14 if you bought at full price, so it was almost like you got the diapers free. After “moms” I went to Albs and got my free boxes of simple harvest oatmeal. I want to go back and do a few more deals armed with some more Safeway doubles! Speaking of feeling silly though, I was going to have $0 oop and I was walking around the store trying to find something else I could buy so I wouldn’t have a $0 balance. I finally shook myself and went through, the checker was impressed with my deal and I paid nothing. did this deal end yesterday? or does it go through today? Thanks! For the stores that rolled the pampers cats, it was awesome. At least while it lasted. I found the cat's stated, "not to be used on p & g products" and then there was a ethics debate in my head. Thank goodness I didn't read that before I bought a closet full of pampers!LOL!!! Although, even that didn't stop me from "loaning" my cat's for my sister to roll the diaper deal. Just curious why you purchased the wipes? And did you use your Safeway $10/50 coupon?